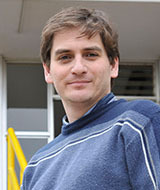 Director of Biophysics and Computational Biology PhD Program at University of Valparaíso. Neurons and neural networks show a complex behavior due to the high non-linearity of their responses to different stimuli. Much of what we currently understand about this behavior has come from the mathematical modeling of the different processes taking place in the cell membrane. The analysis of dynamical systems that arise from the physical and chemical principles underlying the transmission of electrical signals in living organisms, has been a great aid in the understanding of experimental data, and is also a whole research field on its own. Chaotic behavior of neural oscillators. Individual networks and neural circuits, like many other high-dimensional systems, show a behavior known as chaos. This consists in a high sensitivity to initial conditions, where two systems starting at very close initial conditions diverge exponentially in time. Is this property of the individual nodes relevant to the network behavior? Network topology . The topology of neural networks show distinct features, such as being scale-free and showing small-world properties. At the same time, they are different from other typical small-world networks. Which features of the network topology determine or contribute to the multistability of a network? Modeling of the neural networks in the retina, in collaboration with Dr. Adrián Palacios. My interest in this initiative is to develop and analyze conductance-based models of the Starburst Amacrine Cells network in the retina and their role in the direction selectivity of some ganglion cells. Channel noise in neurons: Through mathematical modeling and analysis, we want to understand the diverse effects that ion channel stochasticity has on neural excitability. Xu K., Maidana JP, Caviedes M, Quero D, Aguirre P and Orio P. (2017). Hyperpolarization-activated current induces period-doubling cascades and chaos in a cold thermoreceptor model. Front. Comput. Neurosci. 11:12.